Palestinian scholar of the third century; disciple of Johanan and contemporary of Ammi and Isaac Nappaḥa (Tem. 29a, 31a; Ned. 57b; comp. Yer. Ter. vii. 55a). He was born in Ṭirna, or Torta, identified by Neubauer ("G. T." p. 267; comp. p. 363) with Ṭuria in Palestine, or Be-Torta in Babylonia. 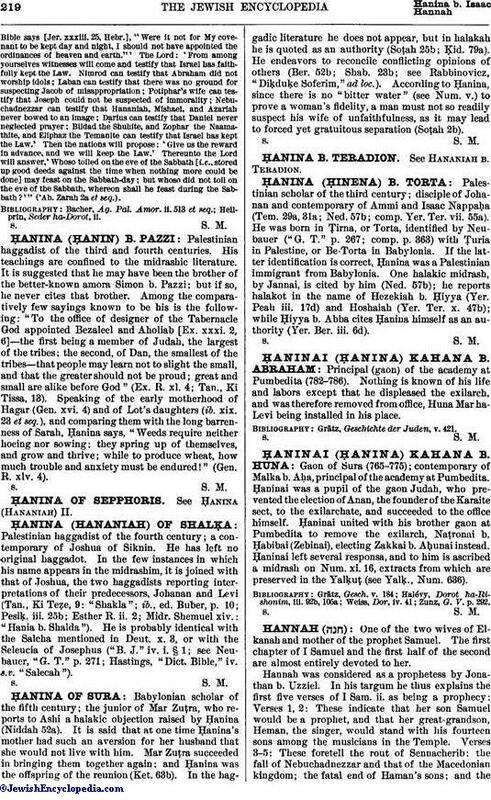 If the latter identification is correct, Ḥanina was a Palestinian immigrant from Babylonia. One halakic midrash, by Jannai, is cited by him (Ned. 57b); he reports halakot in the name of Hezekiah b. Ḥiyya (Yer. Peah iii. 17d) and Hoshaiah (Yer. Ter. x. 47b); while Ḥiyya b. Abba cites Ḥanina himself as an authority (Yer. Ber. iii. 6d).